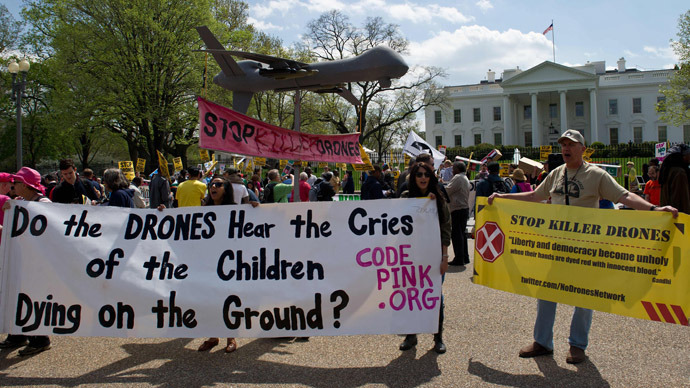 As Washington pushes to expand its drone warfare in Africa, hundreds have gathered in front of the White House to protest the “robotic killing machines” slaughtering thousands across the globe. On the organization’s website people have voiced their reasons behind their protest. “No one should sit passively and allow our government to wage a ‘quiet war’ - an undeclared war but a real war in our name!” Rev. Graylan Hagler, a senior minister wrote. 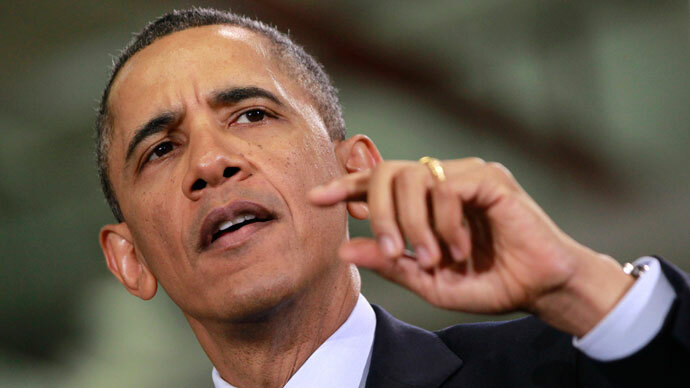 “It's time we Americans join the rest of the world in condemning President Obama's barbaric drone killing spree, a policy that benefits the war profiteers but makes us hated around the world,” Medea Benjamin, Co-Founder of CODEPINK said in his post. 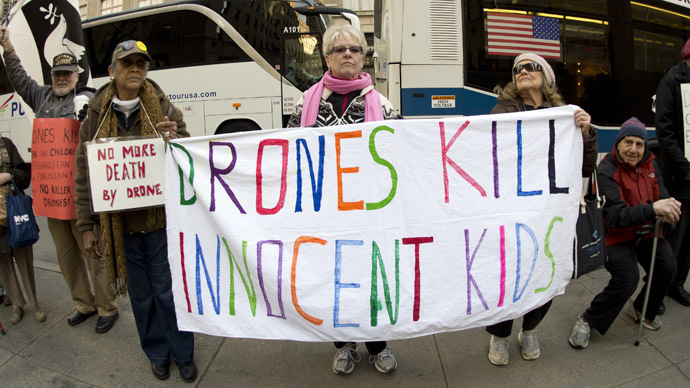 Protesters on the ground have confirmed the overall message of American frustration due to drone strikes worldwide. “We’re saying to this president, we don’t like these policies that turn America into a war-mongering country, an assassination capital of the world,” a protester has told RT. “I don’t want the government that takes my tax money and spends it murdering thousands of people around the world,” another protester concurred. “drones are being used to make sure that the American people are not part of the political equation” allowing wars to be carried out in total secrecy. “A war could be raged, a real war but all the bleeding is done on one side,” Becker said. “Drones are used to violate every nation’s sovereignty. The Obama administration flies them in whenever it wants and kills whoever it wants - that is not legal.” Many of the participants also voiced their anger over Washington’s recent move to expand its military involvement on the African continent. “As an advocate against the re-colonization of Ivory Coast, I believe that drones will be used as war machines to re-colonize Africa. These war toys will surely target freedom fighters and activists opposing Western stooges in power in Africa,” said Leo Gnawa, Coordinator for CRI-Pan African. The North and West Africa are rapidly becoming yet another frontier of the United States’ war on terror. 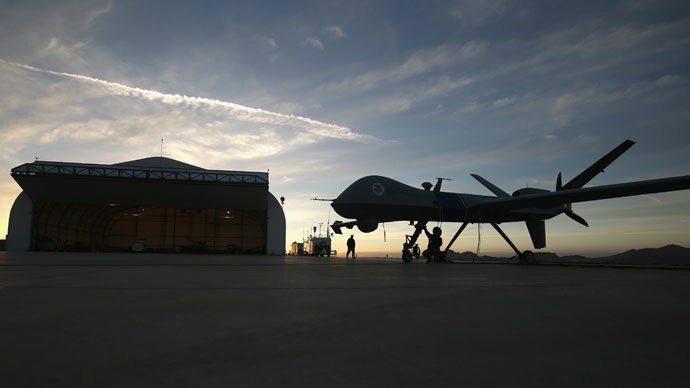 The US has set up a drone base in Djibouti, on the Horn of Africa, and flies unarmed Reaper drones from Ethiopia. Washington has also carried out surveillance flights over East Africa from the island nation of the Seychelles. With the recent introduction of Predator drones in Niger the Pentagon is set to secure a drone stronghold in West Africa as the country shares a long border with Mali, where Washington believes Islamist groups have taken root. Niger also borders Libya and Nigeria two nations barely coping to contain armed extremist movements. The Predator drones in Niger are unarmed and are conducting surveillance over Mali and Niger, but Washington has not ruled out arming them with missiles in the future. All this, as US kick starts its African campaign by sending troops to as many as 35 African nations, citing a growing threat from extremist groups. 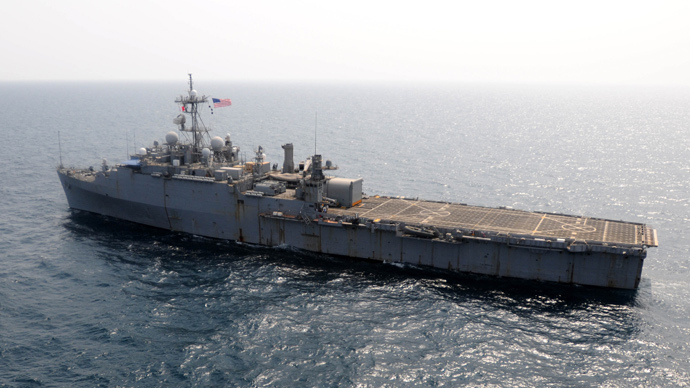 The Department of Defense is hoping to install American soldiers overseas in order to prepare local troops there for any future crises as tensions escalate. Drone strikes were first used after the 9/11 attacks from bases in Pakistan and Uzbekistan, in combat missions inside Afghanistan. More than a decade later, having killed almost 5,000 people, mostly civilians including women and children, Washington has expanded the use of the remotely controlled aircraft into Yemen, Somalia and most of all Pakistan.